But as a replacement you can use jQurey to make your AJAX code which makes it easier to work with AJAX without even making you worry about the code at client side. All you have to do is to craft your back-end code for AJAX response.Let take a look at Core JS code to work with AJAX. In traditional code first you have to think about the browser interoperability; then work on the code to craft GET or POST request; then Send it to server; then wait for response and keep on checking readyState and status to know when the request is completed. And also the getdata.php file is being called by GET request for data. So code is being made at that script. 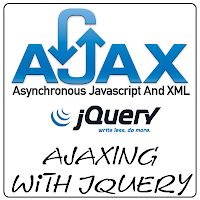 Now lets talk about the AJAX done through jQuery. In jQuery there are many inbuilt functions to handle client side code for AJAX like .ajax(), .get(), .post() etc. For example lets change the above code according to jQuery to do same task. You Got this! Its very simple to make AJAX request and use the response very effectively! $.get() This function is used to load data from remote source asynchronously via HTTP GET and then perform operations on that loaded data by the callback function. $.post() This function is used to load data from remote source asynchronously via HTTP POST and then perform operations on that loaded data by the callback function. $.getJSON() This function is used to load only JSON data from remote source asynchronously via HTTP GET and then perform operations on that loaded data by the callback function. + data.website + " "
$(…).load() This function is used to load data from remote source asynchronously via HTTP GET and then replace the loaded content to the target element. There is also a jQuery event handler load and which one is called is completely dependent on the parameters passed. It also provides some low level event handlers for AJAX to make the application very robust. So go on and play with this. And share your views about this tutorial.